The compulsory veil is a contentious issue in Iran, but what happens when Khomeini's words are used against the regime that he started? Newspaper headscarf: "Regarding the wearing of the veil, there will be no compulsion". Photo from the author.Last month, pictures of a young girl wearing a headscarf made with a newspaper pattern spread through the Iranian social media. The girl is in fact the niece of Iran's jailed Green Movement leader, Mir Hussein Moussavi, but that was not the reason why the picture went viral. The newspaper pattern on the scarf was the front page of the newspaper that printed the Ayatollah Ruhollah Khomeini's pledge in 1978 as its main headline: "Regarding the wearing of the veil, there will be no compulsion".Iranian women didn't have to fight for their rights before the 1979 Islamic revolution. The Pahlavi kings, with their outlook for modernising Iran, handed them a degree of emancipation. Under the founder of the Pahlavi dynasty, Reza Shah, unveiling was enforced, public co-educational primary schools were established, family law was modified and women's schools were quickly developed in spite of a bitter resistance by the Shia clergy who threatened to burn down the schools. During the Pahlavi reign, for the first time since the Islamisation of Iran by the invading Arabs, women once again became active part of the society. Under the second Pahlavi king, these rights were extended; women could vote and stand as candidates in elections and they took up official positions, including in the cabinet and in the administration. As with anything that you don't have to fight for, you may not appreciate it much until it is taken away from you. Most Iranian women were duped in 1979 with Khomeini's promises of equal rights for women and most notably Khomeini's unequivocal promise during his stay in Paris, that "regarding the wearing of the veil, there will be no compulsion." A promise that became the headlines for the front page of newspapers before the victory of the Islamic revolution. After the victory of the revolution, Khomeini reneged on many of his promises made to the media during his stay in Paris. 'Yes, yes, I said lots of things in Paris' was how he brushed aside when he was once reminded of those pledges he had made in Paris. Iranian women soon found out, albeit too late, that the revolution that many of them had taken part in was in fact intent on turning them into second-class citizens. The compulsory veil became a fundamental constituent of the Islamic Republic that it is now identified with and also a focal point for the women of Iran to show their opposition to the regime. This struggle over the compulsory wearing of the veil is one that the Islamic Republic has been gradually losing but not been completely defeated yet. A struggle that has surprisingly received little sympathy and support from European feminists. Over the 37 year life of the Shia theocracy in Iran, the compulsory headscarves that were meant to cover every strand of a woman's hair have been inch by inch pushed back in a cat and mouse game. The drab black chador that covers women from head to toe—the preferred dress code of the regime for women—has been replaced by brighter, innovative, more appealing and aesthetic styles of colourful headscarves and overcoats. 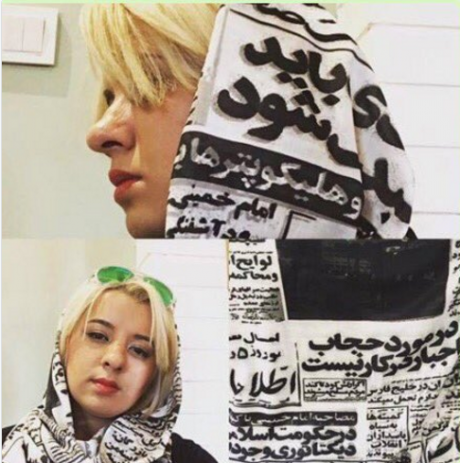 This innovative headscarf with the newspaper headline is yet another genius move and a double edged sword by the Iranian women in their struggle against compulsory veil. What will the Protection of Virtue and Prevention of Vice squad do with such a scarf? If they object to it, they will be objecting to Khomeini's words and if they let it be, everyone will be reminded of yet another false promise that was made to them.